The Admiral, sensing the danger on two fronts, gave immediate orders to Starbuck to keep those Fracking Cylons occupied, so he could deal with this, personally. The CAG showed her worth, not only diverting the Raiders, but crippling them. Not destroyed as hoped, but removed from the fight for a while. I never noticed until now that the “xxxx is replying…” line is animated. Radiological alarms were spiking all across the fleet. Some, certainly it seemed, were deoys. Duped signals hacked by the Cylons. But the clock was ticking. They could check one, maybe two, ships in time, they estimated. And getting that done was easier said, with the birds circling. Gut check. The Admiral needed to make a call. 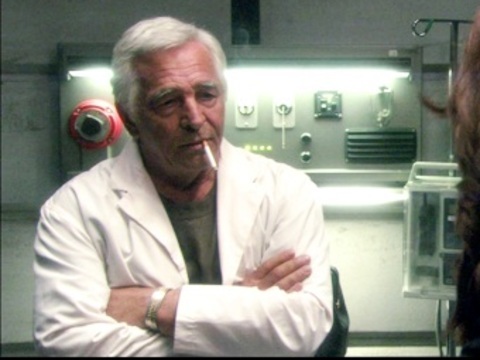 He pulled the doctor aside, and though not a scientist, he was technically technically proficient. He could probably fix the scanner. Eliminate a few false positives. Probably not all of them though. No time, do it. Take the lead, I’ve got work to do. The Admiral knew the state of the fleet. Civilians largely whole, at the expense of damn near every spare ship he had. It was a good trade, so far, but it was hamstringing him now. Demetrius, Anubis, Vengeance, and Argus, follow Starbuck. Quick sweep, find the bomb. Civilians may resent being imposed on by military authority, but he didn’t care. They would hate blowing up more. With each tick of the clock they all worried they would not find the bomb in time though. Was all they heard over the radio, but it was all they needed. The bomb crew, on standby in a Raptor, swept in. Not a moment too soon either. Another two minutes, and they’d be looking at a hole in one of the agro ships. @CraigM, shouldn’t jump prep be one further? If so, let’s risk a jump? I think our chances are ok @jeffreyb @soondifferent @Lantz? That was suspenseful, well done. shouldn’t jump prep be one further? I support either jumping or trying to get some repairs done. I think that is impossible, need to be in the Hangar to repair Vipers. Durr, you’re right. Never knew there was more to repairs than just ordering the rookies and wrench monkeys about. Ok, I am not 100% sure how the Cylon Fleet Board works, but I believe there are too many ships around us now. 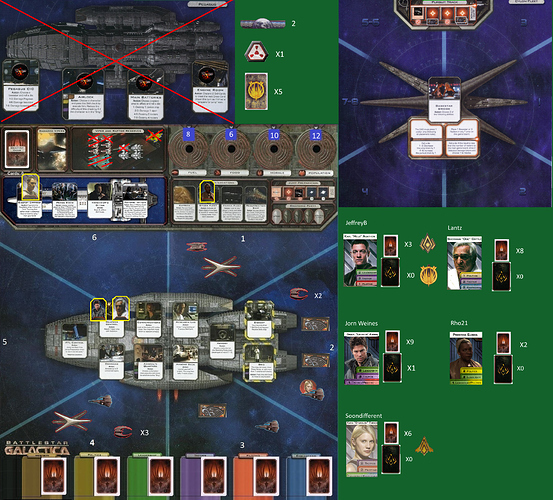 Translation: I’ll jump the ship now and hope I get the 2nd Cylon card so I can do something nasty with my other action.